In January 2016, Magaldi Power SpA had been awarded a contract by ACEA - one of the leading Italian multi-utility firms - for the wet-to-dry conversion of the bottom ash handling system at San Vittore del Lazio waste-to-energy plant. Designed to thermally convert about 400,000 tons per year of RDF (refuse derived fuel), the WtE plant is provided with 3x54 MWth combustion lines. On the combustion lines #2 & 3, the bottom ash handling system was originally wet and equipped with two submerged “Apron-based” conveyors to handle the wet bottom ash from the discharge of the combustion grate to a temporary storage pit. 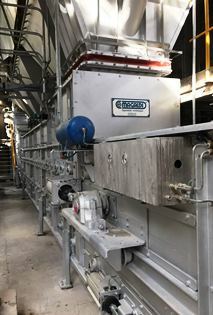 Magaldi retrofitted the twin combustion lines by installing its dry Ecobelt® WA technology. Each combustion line is equipped with two Ecobelt® WA conveyors to extract and cool down by ambient air both the bottom ash and the siftings. Downstream the conveyors, the ash is conditioned by using a small amount of water to keep the dust down and allow a safe transportation to the metal recovery facility. - Recovery of ash sensible heat and chemical energy back to the boiler.